SQUIRMY JELLY WORMS 1. PACK STRAWS INTO A CUP AND SECURE WI - ProudMummy.com the Web's Community for Mums. SQUIRMY JELLY WORMS 1. PACK STRAWS INTO A CUP AND SECURE WITH A RUBBER BAND. 2. POUR N JELLY CAREFULLY. 3. 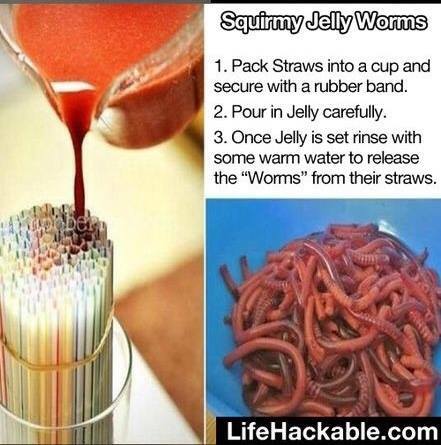 ONCE JELLY IS SET RINSE WITH SOME WARM WATER TO RELEASE THE "WORMS" FROM THEIR STRAWS.